Given their prevalence today, it’s hard to imagine that hybrid cars were once seen as weirdly futuristic. But back at the start of the 21st century, there were two pioneers. 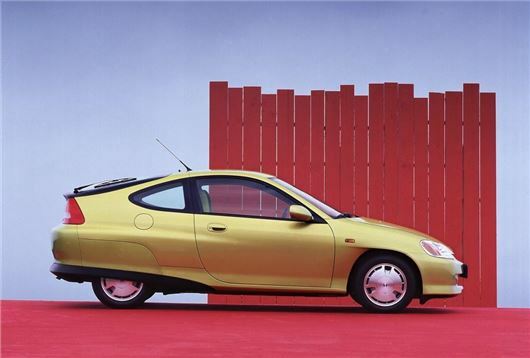 The Toyota Prius and this - the original Honda Insight. The Insight was previewed at the 1997 Tokyo Motor Show as the J-VX Concept Car, a two-door, two-seater coupe with fish-like looks, slippery aerodynamics and a high-tech powertrain. Under the bonnet, the launch car, which went into production in 1999 and landed on these shores a year later, came with a conventional 1.0-litre 68bhp engine, backed up by a hybrid drive system called Integrated Motor Assist, or IMA. Today, that original interpretation of IMA would be regarded as a mild-hybrid system. In city driving, the car’s battery pack and electric motor would take over for low speed manoeuvring and creeping in traffic, while on motorways, ascents and under hard acceleration it would use its power to give the standard petrol engine an electronically assisted boost, meaning that the Insight had the equivalent performance of a 1.5-litre petrol engine rather than the measly 1.0-litre under the bonnet. The hybrid system also helped to cut CO2 emissions, to the extent that it became the first car on sale in the UK to be exempt from the London Congestion Charge. To whatever the Hoxton Hipster was back at the turn of the millennium, the Insight was hot property. A car that was distinctive, cool and doing its bit to save the planet. Performance was adequate rather than rapid, but a 0-60 time of 12.1 seconds and a top speed of over 100mph were enough to make the hybrid Honda capable of holding its own in the cut and thrust of normal traffic, while it was also extremely quiet, especially, of course, when running in full IMA mode. The technology was fascinating, though at the time few imagined it would actually catch on – a fact not helped by the fact it cost £17,295 at launch. At the time, that would have been enough to get you behind the wheel of a high spec Ford Focus, or even an entry-level BMW, meaning that the Insight’s appeal was limited. Between 2000 and 2004, Honda sold less than 250 of them in Britain, the majority either as dealer demonstrators, press fleet or to a handful of drivers who could make the economics stack up on their daily commute in and out of the capital. By contrast, the Toyota Prius was selling in decent numbers – but then, the Toyota was a conventional five-seater saloon, was £2000 cheaper and somewhat more toned down in its weirdness. Yet the Insight has its fans. The car is a wonderful example of a concept car translating into a road car, not in a toned-down way, but if anything in an even more obscure manner. The styling was – and remains – unlike anything else on the road, and while the Insight is massively impractical, it’s quite good fun to drive. It’s a car that may have been a low volume seller when it went on sale, but whose influence has shaped motoring today. Systems like Honda’s IMA are now commonplace, and are set to become even more so as we move towards a petrol and diesel only-free future. It took bravery to challenge perceptions and bring hybrid systems to the market, and while Toyota conventionalised it as quickly as possible, Honda went out on a limb to position itself as a future innovator. The Insight’s poor showroom performance was, in many senses, completely irrelevant. Today, the original Insight is a quirky choice of modern classic, which continues to offer tax and C-Charge benefits. It stands out because it looks like nothing else on the road, but it also stands out as a pioneer of modern motoring. And while that may upset the traditionalists, its place in the annals of motoring history is assured. On the other hand, as with my wife's new 2018 Clarity Plug-In Hybrid, the 3rd-generation 2019 Insight Prototype I just saw at the auto show in Detroit DOES shut off the engine and use its electric motor for low-speed manoeuvring or when creeping in traffic.